This weeks challenge on PaperTake was a sketch by Katharina. This week is a cute little sketch, I may just make another card this week using this sketch. I'm really enjoying doing these challenges. 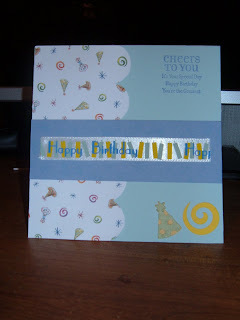 On the middle strip under the Happy Birthday ribbon I used my SU Confetti Stamp Wheel and inked it very lightly (so lite you can't even see it in the picture) I didn't want to overpower the pattern paper already on the card. The party hat and swirl at the bottom were cut on the cricut (doodlecharms and mickey & friends cartridges). The saying in the upper right corner is SU Lots of Thoughts Stamp Set. Actually, this card could be used as a masculine birthday card, it's not to girly. Wow, fab card - love it!